We’re excited to announce that teams can now use MongoDB Atlas — the global cloud database for MongoDB — for free on Microsoft Azure. The newly available free tier on Azure Cloud, known as the M0, grants users 512 MB of storage and is ideal for learning MongoDB, prototyping, and early development. The Atlas free tier will run MongoDB 4.0 and grant users access to some of the latest database features, including multi-document transactions, which make it even easier to address a complete range of use cases with MongoDB; type conversions, which allow teams to perform sophisticated transformations natively in the database without costly and fragile ETL; and updated security defaults (SHA-256 and TLS 1.1+). Like larger MongoDB Atlas cluster types, M0 clusters grant users optimal security with end to end encryption, high availability, and fully managed upgrades. M0 clusters also enable faster development by allowing teams to perform CRUD operations against their data right from their browsers via the built-in Data Explorer. 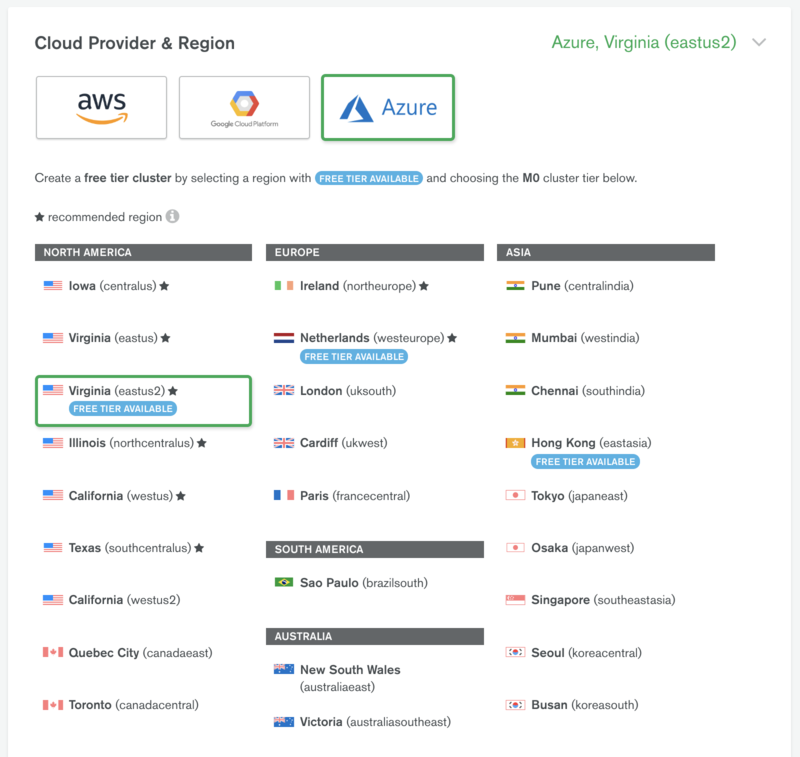 Finally, free tier clusters on Azure can be paired with MongoDB Stitch — a powerful suite of serverless platform services for apps using MongoDB — to simplify the handling of backend logic, database triggers, and integrations with the wider Azure ecosystem. Creating a free tier is easy. When building a new Atlas cluster, select Azure as your cloud of choice and one of the regions above. Next, select M0 in the “Cluster Tier” dropdown. Then, give the cluster a name and hit the “Create Cluster” button. Your free MongoDB Atlas cluster will be deployed in minutes. New to MongoDB Atlas? Deploy a free cluster in minutes.